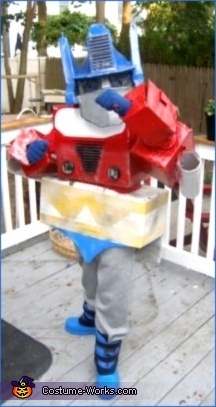 A battle damaged Transformer known as Optimus Prime is the costume of choice this year for 8 year old Josh. This is another great costume made by Bob, my friend in NJ. One thing you cannot SEE about this costume is that it has lights that light up and a secret lid in his left arm that he can open up to a communicator that actually SPEAKS! Bob sure doesn't miss any bells or whistles when he's working on these cool costumes for his family and/or friends. Thanks also to Josh. You make an AWESOME Transformer Josh!